Directed by Jean Sorgues, illustrated by Bécan, this Gallimard Series shows the progressive dominance of Crime Fiction within the market of entertainment literature. While the first novels published there reflect a variety of popular genres, the subsequent are mostly linked with a Crime fiction narrative. Such as :René Girardet, L’Etrange M. de Lorgemont, Les Chefs-d’oeuvre du roman-feuilleton, Gallimard, 1927. 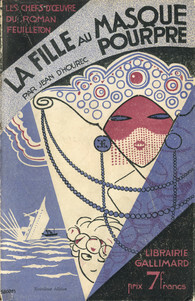 Or Jean Fournier, Higgins and C°, détective, Les Chefs-d’oeuvre du roman-feuilleton, Gallimard, 1928. A.E.W. 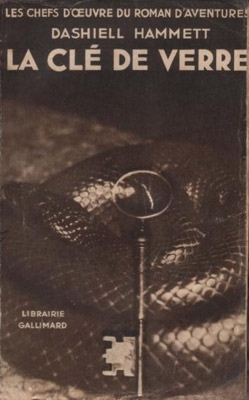 Mason (Le Reflet dans la nuit, 1928), Gustave Le Rouge, H.J. Magog and S.S. Van Dine were equally published there. 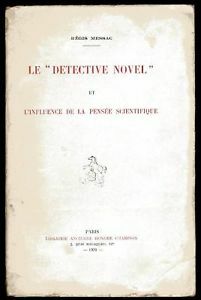 The series later morphed into ” Les Chefs-d’oeuvre du roman d’aventures”, where Dashiell Hammett was first published in France. Starting in 1926, this series consists of 39 booklets In-16. The format was 18 x 12,5 cm and the cost of the 32 pages novels was 50 centimes.The covers were illustrated by Gil Baer (aka Gilles Berr, 1863-1931). 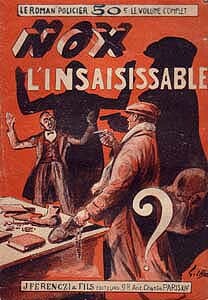 Georges Simenon published in this series in 1926, under the Pseudonym of Christian Brulls what is considered his first venture into the detective genre : Nox l’insaisissable (see below). 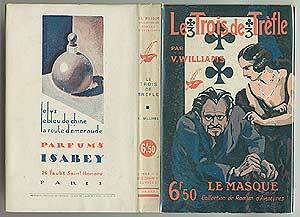 « Le Masque » (“Mask”) is one of the most successful and longest crime series worldwide, with 2540 titles published. While not the first series devoted to detective novels in France, it was a landmark in the publishing industry. Launched in 1927 by Albert Pigasse, founder in 1925 of the Librairie des Champs-Élysées it soon acquired iconic status. Its first publication was Agatha Christie’s The Murder of Roger Ackroyd. Pigasse acquired Christie’s exclusive rights in France. But among other mainstay household authors were Dorothy Sayers, R. Austin Freeman, John Dickson Carr. This prestigious “collection” (Publisher Series) predates the influential Série Noire, launched after W.W.2 with the same publisher, the Librairie Gallimard in Paris. International bestsellers of the crime genre, comprising Classics of mystery and detection novel (Austin Freeman) ,thrillers (E. Wallace) and authors representative of the “golden age” of crime fiction (Van Dine) were published here together with illustrious French heirs to the 19th Century’s Serials (Le Rouge). This is also were the first French translations of Hammett’s Glass Key and the Dain Curse were published. Reblogged this on International Crime Fiction Research Group.